Padded Collars are made in the Alaskan Circle style with 5000 lb break strength nylon webbing that is sewn with bonded nylon thread for durability. They are padded with triple thick 300 weight fleece for maximum comfort that helps those dogs that tend to rub the fur off their neck as well as those with thin coats. 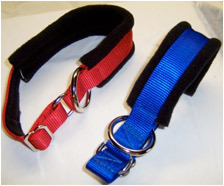 These collars are not as adjustable as our regular collars so they are sized. See details in above. They are stocked with 1-1/2" rings. Bought this for a Rough Collie who gets nasty knots around her ears during walks. I'm hoping this won't rub as much as a choke or regular collar. The price is fantastic, and the quality is phenomenal!